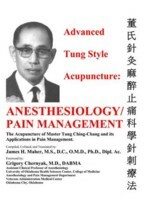 This fifth volume in the Advanced Tung series is focused strictly on treatment of pain. The protocols are meant to achieve pain relief as quickly as possible. There are over 250 treatment protocols that address a wide variety of common pain disorders. Included is an expanded pain index that facilitates locating specific treatment protocols.